The tiny cages of metal-organic frameworks may hold the key to making nuclear power more feasible by capturing and retaining radioactive elements such as xenon and krypton from the reprocessing of used nuclear fuel. Enlarge/expand Image. Results: Metal-organic frameworks (MOFs) of metal ions and organic molecules have the potential to grant batteries a longer life and bring sustainable energy technologies to the developing world. Now in the highly regarded journal Accounts of Chemical Research, an international team led by scientists at Pacific Northwest National Laboratory proposes applying these MOFs to make nuclear power more feasible. The MOFs they identified can capture dangerous radionuclides released during the reprocessing of used nuclear fuel. Why It Matters: The amount of used nuclear fuel is the key limiting factor to making nuclear power a source of clean energy that could meet the world's electricity needs far into the future. To minimize this waste, countries such as France, Japan, and Russia routinely reprocess used nuclear fuel. Unfortunately, reprocessing can release radioactive elements such as the noble gases xenon and krypton into the air. Concern over these elements is one of the reasons the United States does not reprocess the 2,000 to 2,300 metric tons of used nuclear fuel generated each year. MOFs can be tailor-made to pull in and hold xenon and krypton, preventing their release to the environment. The use of these tiny cages opens the door to reprocessing nuclear fuel and recovering valuable metals such as uranium, extending fuel supplies, and ultimately minimizing the amount of waste. Methods: To find the most likely MOF to separate xenon and krypton from air, scientists turned to advanced computer programs to estimate and analyze MOF structure and properties. In this breakthrough approach, the team looked at the capacity of each MOF, which elements the MOF tended to select to adhere to its cage, where the elements tended to adhere, and other factors for existing MOFs if used in an industrial setting. 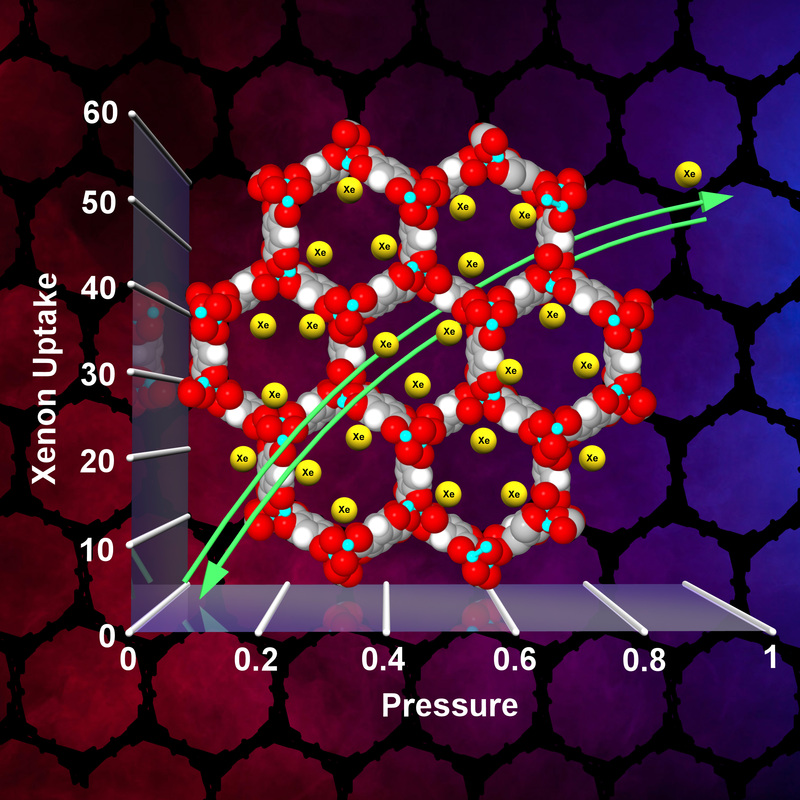 What's Next: Researchers plan to apply their simulations to other problems that could be solved by MOFs. For example, separating xenon and krypton from air today requires energy-intensive and therefore expensive cryogenic distillation. The broad range of applications of the two noble gases, particularly in lighting and medical industries, makes it imperative to discover alternate approaches that lower costs. Sponsors: The U.S. Department of Energy's Office of Nuclear Energy sponsored this research. Research Team: Debasis Banerjee, Amy Cairns (now with Aramco Services Company), Jian Liu, Radha Motkuri, Satish Nune, Carlos Fernandez, Denis Strachan, and Praveen Thallapally, PNNL; Rajamani Krishna, Van't Hoff Institute for Molecular Sciences, University of Amsterdam. Reference: Banerjee, D, A Cairns, J Liu, R Motkuri, S Nune, C Fernandez, R Krishna, D Strachan and P Thallapally. 2014. 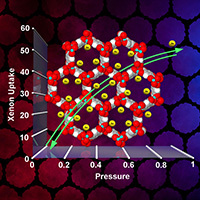 "Potential of Metal-Organic Frameworks for Separation of Xenon and Krypton." Accounts of Chemical Research 48(2):211-219. DOI: 10.1021/ar5003126.